who is the one wearing sunglasses. white arrow is pointing at. Something else that occured to me. which shall prepare thy way before thee." address is for a defunct website for western Maryland. Also, the pages that the site link to are worth checking out. "Samuel Fuller facing camera in sunglasses directs Crimson Kimono in Downtown Los Angeles Little Tokio"
George Yoshinaga, the actor who plays the character "Willy Hidaka" in this same film. is a quote ( if I recall from Stephen Dedalus' walk in Sandymount strand Dublin in James Joyce Ulysses. ~This and the associated emails to you suggest a mistake was made. By the way as regards those e mails the synod of whitby if i recall was about setting the date Easter. maybe the reference to Manhatten project and such are references to dates? Anti-Spam here demands that I type TIME..
"It's a poor sort of memory that only works backwards". in which the White Queen says to Alice: "It's a poor sort of memory that only works backwards". We should really look for abstractions/archetypes here.. instead of getting caught up in the "Trees" . The area that talks about congruent elixirs [p<0.01] looks like it is talking about hypothesis testing. being used for the hypothesis test is. Alpha values are typically values of either 0.1, 0.05, or 0.01.
when I am able. I hope this helps. Early detection of isotopes over North Korea, but to be analysed. or have a good idea of what the person is about, they can work it all out, well close to it. Different levels all over these Mayday things.. Intersting but iv,e had enough. of the earth is near. The answers to the future are in the past. pointing in a manner very similar to the man's arm. Coincidence? P>.01 in statistics means that the probability of something happening is less than one thousandth. The part where our infamous Mistah Kurtz is mentioned popped out to me. Apparently, the "target" (apparently targeted in 2005) has been excessively talkative or abnormally incoherent. Which has something to do with the chemical cyp2c19 which helps metabolize xenobiotics, or diazepam and other barbiturates. Have the orphanage gone into kidnapping and drugging of targets? The freaks don't see malicious in that way. Just wanted to take a stab at it. Comments: This may not be much help but I kept looking at the Greek and roughly translated the phrase to "Adelphoi, proseuchesthe peri ximon"." "brothers and sisters." I can't help but notice the comma placed behind this so I keep thinking it may be some sort of salutation. Proseuchesthe roughly translates to offering prayer. As someone mentioned above me, this word does find reference in several parts of Matthew and Mark. Peri, as far as I can tell, is simply a Greek preposition meaning "about, concerning." Lastly, there was Ximon. Although preliminary searches did not turn up much, I discovered that Ximon is one variation of Simon. This brought to mind Simon the Zealot. organization (or all believers) to pray around/for Simon's intercession. Just my two cents. 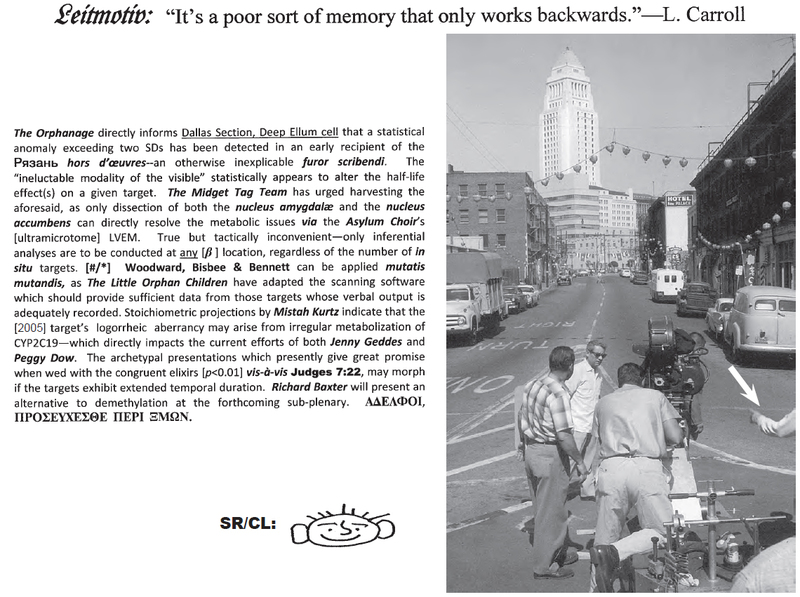 The Leitmotiv: "It's a poor sort of memory that only works backwards". It is one of C.G. Jungs's favorite quotes about the concept of synchronicity. A synchronicity is a meaningful coincidence. The freaks often say "Ain't no co-in-see-dents". "The interplay of coincidence...completely before god's eye, in advance displayed." "Des Zufalls Wechselspiel...vollst�ndig liegt es vor Gottes Aug' im voraus abgebildet."